Speaking at a “Lets Move” event yesterday, First Lady Michelle Obama excitedly revealed to the crowd of children that she would be traveling to London for the 2012 Summer Olympic games. “(T)he true spirit of the Games isn’t confined to just the two weeks of competition in the summer. It’s not just about who wins the Gold, right? You’ve heard that before. 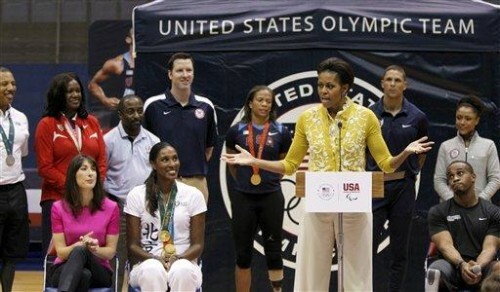 It’s not just about who wins the medals, right?” said Obama, according to a transcript of her remarks.